Tragedy struck Minnesota on August 1, 2007, when the Interstate 35W Bridge over the Mississippi River in Minneapolis collapsed, killing 13 travelers and injuring 144 more. The collapse resulted in major traffic delays since the bridge was crossed by 140,000 vehicles daily. 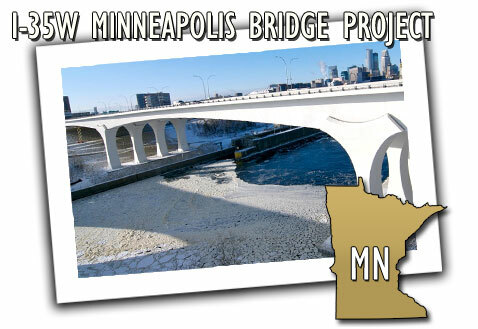 Only four days after the disaster, MNDOT issued a request for qualifications to contractors interested in designing and building a replacement span. Knowing the urgency of getting a new bridge built, the department received technical proposals less than two months after the incident and executed a contract in early October 2007. The contract called for construction of the new bridge in 437 days. The $234 million project was completed three months ahead of schedule in September 2008, using effective schedule management, innovative contracting techniques, and community interaction. The new I-35W Bridge includes five lanes of traffic in each direction, reconstructed ramps at the interchanges on each side of the bridge, and room to accommodate a future light-rail line. The project also included the world’s largest anti-icing system, smart bridge technology, reconstruction of the project approaches and various local streets adjacent to the project, and construction of observation decks under the bridge along the Mississippi River banks.